The challenges facing urban entrepreneurs and the best ways to overcome them were among the discussion topics at the inaugural Urban Entrepreneur Roundtable held recently at Orlando City Hall. Dozens of entrepreneurs attended the free event to learn about business growth and challenges, government contracts, small business loan opportunities, accelerating startups, sustainable community programs and additional resources available on the local, state and federal levels. Carol Clark, with Orange County Mayor Teresa Jacobs’ Office of Public Engagement and African-American Affairs, attended the event. Entrepreneurs had the opportunity to interact with two panels: Unleashing Ideas: Barriers and Challenges for Urban Entrepreneurs and Better Together and the Public-Private Partnerships to Accelerate Urban Entrepreneurship and Startups. The Urban Entrepreneur Roundtable to Educate, Enlighten and Empower Entrepreneurs was presented by the African-American Chamber of Commerce of Central Florida (AACCCF) and the U.S. Small Business Administration (SBA). Cassius Butts, regional administrator, served as moderator. “As a White House appointed official, one of the most significant lessons I have learned for small business is that collaboration is the key to success,” Butts said. Bringing federal and local viewpoints together to educate small business owners about access to funding, advocacy and training opportunities is a “win-win opportunity,” said John Davis, president of the AACCCF. 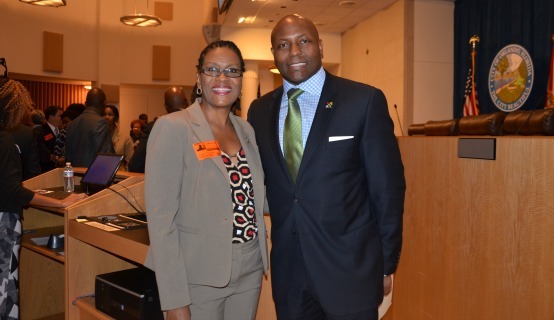 Orange County remains committed to supporting minority entrepreneurs through the Black Business Investment Fund (BBIF). In 2013, the Board of County Commissioners allocated $135,724 to BBIF, a Community Development Financial Institution and non-traditional lenders that specializes in providing loans to black, minority, and underserved small businesses. “We are excited to have had such a dynamic group of panelists eager to share their experiences and tips with our talented and promising future entrepreneurs of Central Florida,” said Vernice Adkins-Bradley, board chair of the AACCF.